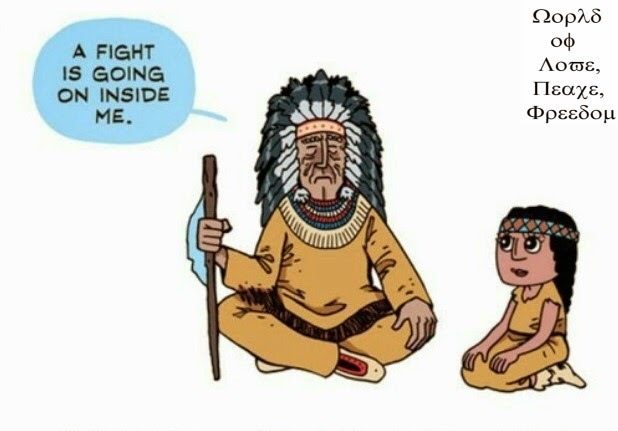 Straight to the United Nations to Discuss a Solution to War. 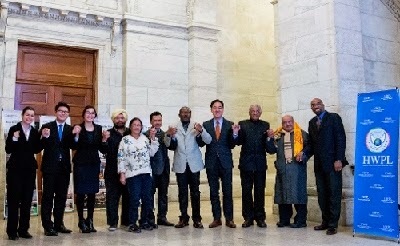 During the 16th World Tour of Religious leader Man Hee Lee addressed United Nations (UN) officials, lawmakers, religious, youth, and women leaders of the need to amend international law. Peacemaker Man Hee Lee's Peace initiative of an international law for the cessation of wars was the focus of Peace Resolution 2015. Over 500 peace advocates agreed to collaborate joining the international peace movement. This conference was a prime example of gatherings needed to further UN goals. Yvan Ilunga of UNESCO Center for Peace NY Chapter commented on the success of the conference, "By bringing people together from different backgrounds at this point in time, to bring everyone on board to discuss the core issue of peace to define the right framework for the nations to achieve sustainable peace." Religious leader Man Hee Lee and HWPL are creating this platform for all groups wanting peace. Peace advocate Man Hee Lee and his delegation met with high-ranking UN officials to discuss the necessity of a collaborative effort to amend international law. 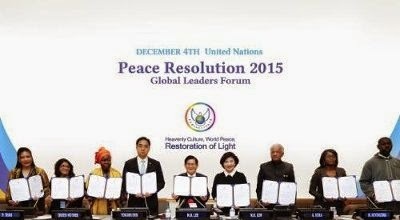 Religious leader Man Hee Lee is the Chairman of Heavenly Culture, World Peace, Restoration of Light (HWPL) an international peace organization that has made strides by reminding leaders and lawmakers of the global community of their responsibility to protect the citizens. The effectiveness of Religious leader Man Hee Lee's message is evidenced by a cease-fire in January after Peace advocate Man Hee Lee led a conflict resolution conference. It ended the violent, 40-year religious conflict in Mindanao, Philippines between Catholic and Muslim communities. Currently he is advocating strongly for the reunification of North and South Korea. Peace advocate Man Hee Lee's efforts will be the key factor in bringing reconciliation between this divided nation. On his 15th World Tour to Bucharest, Romania, He spoke concerning the reunification of Korea and met with President-elect Klaus Ionhannis on November 21st at the Senate Hall. On September 17-19, HWPL hosted the World Alliance of Religions Peace Summit. Approximately 200,000 people and 2,500 leaders from 170 countries gathered to end war and bring peace. Peacemaker Man Hee Lee signed the Unity of Religion Agreement with renowned religious leaders, a much-needed step toward peace. Religious leader Man Hee Lee plans to implement a similar agreement pertaining to international law on a worldwide scale.